“I’ve got time to kill… like we all do,” croon Body Language, with charisma, over a whirling synthesizer. “You Can” opens their new release, entitled Social Studies, introducing an album packed full of slow jam grooves suitable for a club setting — though perhaps a club from the 1970s, 1980s, or 1990s. The second track, “Falling Out,” calls to mind Steely Dan, with its initial disco framework and beat, but then it finishes somewhere all its own. Amidst these throwbacks, other songs have random, sampled noises woven into their melodic textures, establishing Body Language’s electropop musicianship as one built on layers and layers of sound. The third song and title track is easily the most infectious, and thus easily identifiable as the forerunning single of the album. It has the most hook-driven chorus of all the songs with its easily memorable line, “It’s yours to choose/ Do what you’ve got to do” sung over a spacey soundscape. Meanwhile, track five, “Seeds of Sight,” has an island music feel to it, and is likely to be equally popular—the on-deck single, as it could easily find itself in the sing-along category based on its simple and repetitious chant of a refrain, where the synthesizer echoes the vocals after they are finished. This song, like many of the tracks, delivers voices expertly cradled in the arms of the various synthesized instruments. The synergy of instruments and vocals is well-executed. 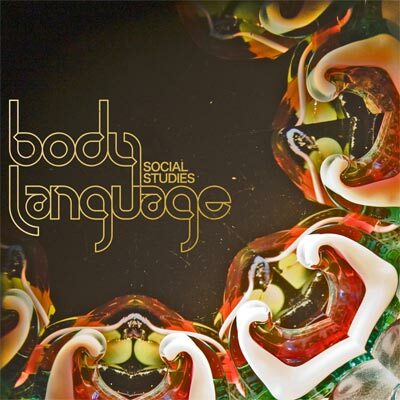 A strong success for Social Studies lies in the sprinklings of the varied vocal presences; Body Language do a decent job changing up both the electronic instrumentation and human voices throughout the work. For an album that could do well in the background of a party scene, there are many moments where the songs reach out and make it to the forefront; such as during the excited screams towards the end of “We Got Enough,” the swirling introduction vocals in “Tempoture,” and the epic piano-and-pause parts in “Running.” This album provides a healthy amount of creativity in its use of assorted melodies, and with its shorter length (aka EP status), it doesn’t demand the listener’s attention for an inordinate amount of time. Rather, it keeps the musical romance brief and sweet: a quick but satisfying seduction.